In the late 1800s and in the first half of the 1900s, Tucker Brothers became one of the largest and most respected firm of builders in the local area. In the 1960’s when a previous owner of our own house moved to a more modern one he insisted that it had to be a ‘Tuckers Brothers house’ such was their reputation for quality. William was a master cordwainer (shoemaker) born in London about 1792. We don’t know what led him to head west but by 1818 he had married Joanna who was born in Berkeley in about 1792. Their eldest son, William was born in Falfield about 1818. By 1841 they were living in Falfield with seven children: William born about 1818, George and Elizabeth born about 1825, John born about 1826, Thomas born about 1831, Mary Ann born about 1835 and Sarah born about 1837. In 1851 they were still shown as living in Falfield. They had the following children: William aged 32, a journeyman cordwainer born in Falfield, John a journeyman cordwainer aged 24 born in Falfield, Thomas a journeyman carpenter aged 19 and Mary Ann aged 15 and Sarah aged 13. The 1861 census shows that Thomas had moved to Thornbury (see below). Thomas’s brothers, William and John had remained in Falfield. They were living in two 4 roomed cottages next door to each other. Both had continued as cordwainers. John had married Mary and they had 3 children (Mary, John and Emily). The census shows that their mother, Joanna, is living with John and his family, and their father, William, still a cordwainer, is living with William who is still unmarried. By 1861 Thomas had married Emily who was born in Kingswood about 1830 and they had moved to live with the family of Thomas Wilson at 21 St Mary Street, Thornbury. Thomas was a joiner and he was living with Emily aged 30, and their children, Lucy born in 1855 and Frank born in 1859. Thomas’s brother, George, was living next door at what became 23 St Mary Street. The 1867 Rate Book shows Thomas as the tenant of one of the small houses in Silver Street (later to become part of 7 Silver Street). The 1871 census shows that Thomas and his family had now moved to St John Street. We believe they were living in the house now known as 17 St John Street. Thomas is shown as a master carpenter employing 1 boy. Their children were Lucy, a dressmaker aged 15, Frank aged 12, George aged 8, Henry aged 5, and Emily aged 2 (born on 18th November 1868). Thomas died on 23rd September 1877 aged 46 years. The 1880 Rate Book shows that Mrs Tucker had taken over the tenancy of 17 St John Street. The 1881 census shows Emily was a widow aged 50, living in 17 St John Street with Frank aged 22, George aged 18, both carpenters and Harry, a draper aged 15 and Emily aged 12. Boarding with the family was Alice Rider, a schoolmistress at the Council School. She was then aged 21 and born in Bedminster. Alice was soon to become the wife of Frank Tucker. Emily carried on living with her son, George, and his family in their house at 12 Gloucester Road. She died in 1906 aged 75 years. 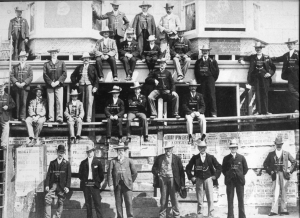 Frank and George followed in their father’s footsteps and worked in the building trade (see below). The family firm of Tuckers the builders became known as ‘Tucker Brothers’ run initially by Frank and George Tucker. They operated from workshops in the Old Quaker Meeting Room in St John Street and they used the Quaker burial ground behind the meeting room for storage. They also acquired other land and buildings in Crispin Lane where they built a stable for the horses and other buildings for storage. In 1926 Frank acquired number 13 St John Street, the house next door to where he was living, and this was used as offices for the business. The earliest reference to this partnership we have found so far was in the Thornbury Baptist Church records. This shows that in 1884 an estimate of £326 10s submitted by Messrs F & G Tucker for building the new chapel at Tytherington was accepted. There are many references to the Tucker Brothers in the records of the Congregation Chapel (now called the United Reformed Church). George’s photograph can be found in the Church and it seems that he was a Treasurer there. The Tucker family apparently had a great deal of involvement in the church. 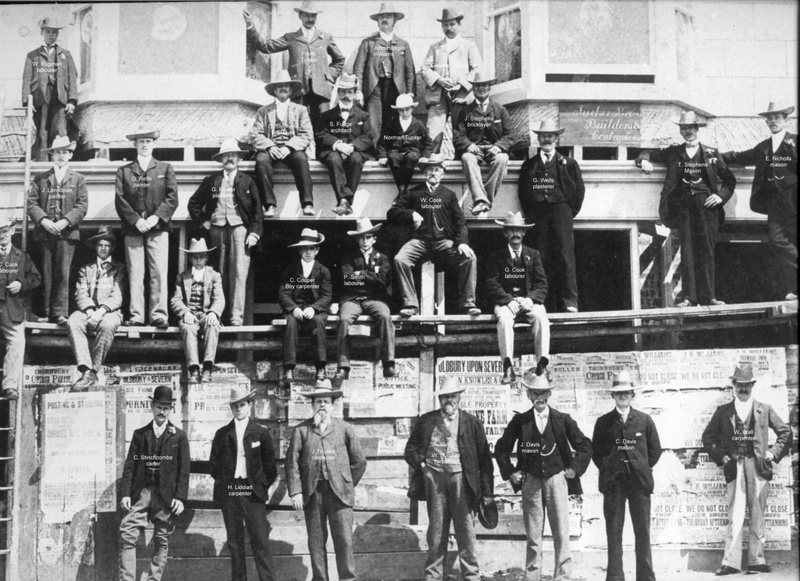 The Tucker Brothers became one of the biggest building firms in Thornbury, employing a large number of men. They were involved in many major building projects in the area including the six houses opposite the old Grammar School (now 13 -23 Gloucester Road) and the red brick houses in Church Road. The photograph at the top of the page was taken in 1902 when the firm was refurbishing John Hodges Williams’s property at Coronation House, High Street. Click on the photo to see the full size image which shows the names of the people. There were actually two generations of Tucker Brothers. The first was Frank and George who set up the business and made it such a success. Following George’s death in 1931 and Frank’s death in 1937, the business was taken over by Norman and Ronald, the two sons of Frank.